T.J.Maxx stores, which offer a variety of products in designer brands voiced a holiday sale which would see thousands of customers flocking their stores nationwide. The store went social as it confirmed via Twitter that it would offer Apple’s iPad at a discounted price. The discount store begun selling the 16GB Wi-Fi version of iPad for $399. A $100 discount for an Apple gadget, that’s surely a WOW. Originally the Apple iPad is priced at $499. 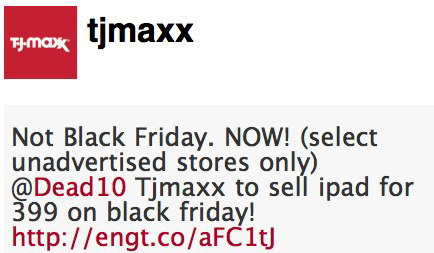 As T.J.Maxx made an announcement, team members @BlogsDNA predicted it to be a Black Friday Deal, but we just got to know that the a number of T.J.Maxx stores are already selling the device. In another update we hear that the device is available on a discounted price at selected stores. Aaron at Engadget reported that it got hold of an Apple iPad at the discounted price, and was amongst a few would benefited from the $100 off the original price. Store details were not live but we did hear that Aaron got himself the gadget from at T.J.Maxx store in Vernon, New York. Obviously the stock is limited, so you need to be fast in locating the store and grabbing a tablet. The iPad would surely be one of the hottest gift for the holiday season and if the users are able to locate the stores and spread the word, the tablet would become one of the fastest selling electronic device in the U.S.